Federal Reserve officials signaled on Wednesday they’re prepared to move interest rates higher or lower as needed, but an unusual mix of risks means they could remain on hold all year. Despite an economy that is forecast to grow above trend with low unemployment, policy makers are worried about external drags such as slowing European growth, the potential of a disruptive Brexit and the ongoing Trump trade war. Domestically, they are concerned about an inflation rate that is decelerating despite a labor market that is below their estimates of full employment. The result is an interest rate policy that is on hold and might remain so even if some of these risks resolve into a more optimistic outlook. That’s basically the message in the minutes of the Federal Open Market Committee’s March 19-20 policy meeting released in Washington. At the same time, however, they said a “majority” of officials expected the economic outlook and risks “would likely warrant leaving the target range unchanged for the remainder of the year,” the minutes stated. Central bankers left the target policy rate in a range of 2.25 percent to 2.5 percent last month, and wrote down a median estimate for no hikes for the remainder of 2019. Officials held a discussion about why inflation remains so low despite an unemployment rate of 3.8 percent in March. They wondered if labor markets had even more slack or if the public’s expectations about prices were undershooting their target of 2 percent per year. 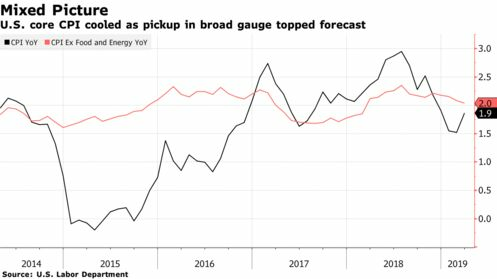 “The discussion around inflation is still slightly downbeat,’’ said Michael Hanson, chief U.S. macro strategist at TD Securities in New York. He added that the committee appears so concerned about the unresponsiveness of prices, that they might not raise the policy rate if inflation moved back to target as downside risks faded. “It is a close call,’’ Hanson said. With prices stuck in a low rate of change, “some participants noted that the appropriate response of the federal funds rate to signs of labor market tightening could be modest provided that signs of inflation pressures continued to be limited,” the minutes said. The Fed’s policy patience comes amid relentless criticism from the White House that is now urging the central bank to cut rates. On Tuesday, Mike Crapo, an Idaho Republican and chairman of the Senate Banking Committee, joined the chorus, saying rate hikes so far were creating “a little bit too much of a dampening” on the economy. The minutes contained no discussion of Washington politics, and, if anything, officials also seem prepared to disappoint Republicans if they have to. “Some participants indicated that if the economy evolved as they currently expected, with economic growth above its longer-run trend rate, they would likely judge it appropriate to raise the target range for the federal funds rate modestly later this year,” the minutes said.